Lumbermen and trappers first set up camps in the area in the 1810s. The first settlers came to what is now Caribou in the 1820s. Between 1838 and 1840, the undeclared Aroostook War flared between the United States and Canada, and the Battle of Caribou occurred in December 1838. The dispute over the international boundary delayed settlement of the area until after the signing of the Webster-Ashburton Treaty in 1842. With peace restored, European settlers arrived in gradually-increasing numbers beginning in 1843. From Eaton Plantation and part of half-township H, Caribou was incorporated in 1859 as the town of Lyndon on April 5. In 1869, it annexed Eaton, Sheridan and Forestville plantations. On February 26 of that year its name was changed to Caribou, only to revert to Lyndon on March 9. On February 8, 1877, Caribou was finally confirmed as the town's permanent name. Two enduring mysteries are the reason for the original name of Lyndon, and the reasons for the town's name being subsequently changed back and forth between Lyndon and Caribou. Caribou was the "jumping off" point for a large influx of settlers who immigrated directly from Sweden in 1870-1871, and settled the nearby "Swedish colony." The small town grew throughout the late 19th century, and with the coming of the Bangor and Aroostook Railroad in the 1890s, agricultural exports exploded. This began a boom period which lasted well into the 1960s. Caribou became the largest potato shipping hub in the world, and had many related industries. Nearby to the northeast, Loring Air Force Base opened in the early 1950s near Limestone, with bomber and tanker aircraft of the Strategic Air Command. It provided a major economic boost to the area, with construction starting in 1947 on "Limestone Army Air Field." Caribou was incorporated as a city in 1967 on February 23, but the area's boom period leveled off in the 1970s as a result of difficulties in its traditional potato industry. That, along with closure of the base in 1994, contributed to a decline in population in the 1980s and 1990s. In September 1984, Caribou was the lift-off location of the first successful solo balloon crossing of the Atlantic Ocean by Colonel Joseph Kittinger. This flight is memorialized at the Rosie O'Grady Balloon of Peace Park one mile (1.6 km) south of the city on Main Street. This site includes a large replica of Kittinger's balloon. The Caribou Public Library is a Carnegie library. Designed in the Romanesque Revival style by local architect Schuyler C. Page, it was built in 1911-1912 with a $10,000 grant from industrialist Andrew Carnegie. According to the United States Census Bureau, the city has a total area of 80.10 square miles (207.5 km2), of which 79.26 square miles (205.3 km2) is land and 0.84 square miles (2.2 km2) is water. Caribou is located on the northern bend of the Aroostook River before it heads southeast to join the Saint John River just east of Fort Fairfield, Maine. Caribou is located in the geographical center of Aroostook County, at an elevation of 449 feet (137 m) above sea level. The county is readily accessible by two major highways; Interstate 95 from the south and the Trans-Canada Highway (New Brunswick Route 2) from the north and east. In sparsely populated Aroostook County, Caribou is at the hub of spokes serving the area via U.S. 1 and Maine State routes 89, 161, 164, 205 and 228. In 2013, a bypass was completed just outside the urban limits. Caribou has a municipal airport, with full east-west and north-south runways. It is primarily used for corporate, hobby, and Civil Air Patrol usage. Northern Maine Regional Airport in Presque Isle serves as the primary hub for air service. Daily flights are scheduled to and from northern Maine with daily connections to Boston’s Logan International Airport. US Airways and New England Air Transport serve the airport. Seaports are also close by in coastal Maine, New Brunswick, and Quebec. The closest deep-water port is Rivière-du-Loup, Quebec, 120 miles (190 km) north of Caribou, on the St. Lawrence River. 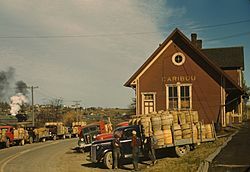 The Eastern Maine Railroad serves Caribou and Aroostook County, also connecting Maine, Vermont and the Canadian provinces of Quebec and New Brunswick and providing a direct rail link between northern Maine; Saint John, New Brunswick; and Montreal, Quebec. Given the city's economic and cultural ties with the Canadian provinces of Quebec and New Brunswick, cross-border partnerships and relationships are often a common facet in many businesses. Caribou has a humid continental climate (Köppen Dfb), with cold, snowy winters, and warm summers, and is located in USDA hardiness zone 4b/4a. The monthly daily average temperature ranges from 10.2 °F (−12.1 °C) in January to 65.6 °F (18.7 °C) in July. On average, there are 41 nights annually that drop to 0 °F (−18 °C) or below, and 92 days where the temperature stays below freezing, including 70 days from December through February. Although 1981–2010 averaged 1.9 days annually with highs at or above 90 °F (32 °C), more than 35 percent of all years on record have not seen such temperatures. Extreme temperatures range from −41 °F (−41 °C) on February 1, 1955 up to 96 °F (36 °C) on May 22, 1977 and June 29, 1944. The average first freeze of the season occurs on September 23, and the last May 15, resulting in a freeze-free season of 130 days; the corresponding dates for measurable snowfall, i.e. at least 0.1 in (0.25 cm), are October 23 and April 25. The average seasonal snowfall for Caribou is approximately 109 inches (2.8 m), while snowfall has ranged from 68.5 inches (1.74 m) in 1961–62 to 196.5 inches (4.99 m) in 2007−08; the record snowiest month was December 1972 with 59.9 inches (1.52 m), while the most snow in one calendar day was 28.6 inches (73 cm) on March 14, 1984. Measurable snowfalls typically occur from late October to early April. A snow depth of at least 10 in (25 cm) is on average seen 76 days per winter, including 63 days from January to March, when the snow pack is typically most reliable. As of the census of 2010, there were 8,189 people, 3,559 households, and 2,206 families residing in the city. The population density was 103.3 inhabitants per square mile (39.9/km2). There were 3,914 housing units at an average density of 49.4 per square mile (19.1/km2). The racial makeup of the city was 98.2% White, 0.0% African American, 1.4% Native American, 0.7% Asian, 0.2% from other races, and 0.2% from two or more races. Hispanic or Latino of any race were 0.01% of the population. There were 3,559 households of which 27.5% had children under the age of 18 living with them, 46.5% were married couples living together, 11.4% had a female householder with no husband present, 4.0% had a male householder with no wife present, and 38.0% were non-families. 32.0% of all households were made up of individuals and 13.8% had someone living alone who was 65 years of age or older. The average household size was 2.26 and the average family size was 2.82. The median age in the city was 44 years. 21.2% of residents were under the age of 18; 7.1% were between the ages of 18 and 24; 23.2% were from 25 to 44; 29.3% were from 45 to 64; and 19.3% were 65 years of age or older. The gender makeup of the city was 48.0% male and 52.0% female. As of the census of 2000, there were 8,312 people, 3,517 households, and 2,324 families residing in the city. The population density was 104.8 people per square mile (40.5/km²). There were 3,858 housing units at an average density of 48.7 per square mile (18.8/km²). The racial makeup of the city was 99.22% White, 0.01% African American, 1.48% Native American, 0.91% Asian, 0.07% Pacific Islander, 0.08% from other races, and 0.0% from two or more races. Hispanic or Latino of any race were 0.46% of the population. There were 3,517 households out of which 27.7% had children under the age of 18 living with them, 52.9% were married couples living together, 9.7% had a female householder with no husband present, and 33.9% were non-families. 28.7% of all households were made up of individuals and 13.1% had someone living alone who was 65 years of age or older. The average household size was 2.32 and the average family size was 2.84. In the city, the population was spread out with 22.5% under the age of 18, 6.6% from 18 to 24, 27.3% from 25 to 44, 26.2% from 45 to 64, and 17.6% who were 65 years of age or older. The median age was 41 years. For every 100 females there were 93.2 males. For every 100 females age 18 and over, there were 88.8 males. The median income for a household in the city was $29,485, and the median income for a family was $38,378. Males had a median income of $29,202 versus $20,737 for females. The per capita income for the city was $16,061. About 8.4% of families and 12.4% of the population were below the poverty line, including 13.7% of those under age 18 and 11.9% of those age 65 or over. Caribou has over a dozen cross-country ski trails with varied scenery and terrain within a one-hour drive of the city. It has two municipal cross-country ski venues; one within the urban limits which has lights for night skiing as well as a visitors center, and a lengthier venue two miles (3 km) outiside the urban limits. Both are consistently well-groomed for skate and classical skiing, and accept donations for usage. The Maine Winter Sports Center is headquartered in Caribou. It is the premier outdoor sports organization in the state. MWSC is active in Caribou's recreational life during all four seasons and sponsors numerous events, including a Ski Dash, Youth Ski Festival, and the Caribou Mile road race. Aroostook County is widely known by sports enthusiasts for its well-groomed extensive snowmobile trail system; Caribou maintains 170 miles (270 km) of Aroostook County’s 1,600-mile (2,600 km) snowmobile trail system. A major tourist destination for snowmobile enthusiasts throughout the country, who take advantage of the more than 1,600 miles (2,600 km) of groomed snowmobile trails, which have been rated the third best in the nation. Snowmobilers can venture out every day, choose a variety of routes and with the number of loop trails never cross the same trail twice. Many county communities are located on the Canada–US border, making international travel by snowmobile convenient. Running through the heart of Aroostook County is the Northeast Snowmobile Trail (NEST), and International Snowmobile Trail System linking Maine, New Hampshire, Vermont, and the Province of Quebec. In 2008, the city finished construction on a large, multi-use recreation, wellness, and community center, which was attached to the existing recreation center. This project is designed to also include a large indoor swimming pool and a fitness center. The construction is being completed in phases. Other recreational options include an excellent 9-hole golf course, multi-use hiking/biking/ATV trails, a four screen movie theater, a frisbee golf course, a roller skating rink, Spud Speedway (the area's only race track), a bowling alley, The Maine Dance Academy, and several excellent parks. Goughan's Berry Farm includes miniature golf, a petting zoo, a carousel, ice cream, and a corn maze in the fall. The community completed construction of a new outdoor tennis complex in 2009, to complement the existing courts at Teague Park. The Caribou Performing Arts Center draws acts and shows from all over the United States and Canada. Caribou also has a thriving music program centered around the Caribou Music Department. Music education has been a vital part of the education system in Caribou for years. Caribou is also home to Echoes magazine, a quarterly publication about rural culture and heritage focused primarily on northern Maine. It recently marked its 20th anniversary, and is read throughout the United States. In addition, the Caribou Choral Society has performed concerts in Aroostook County for the last 35 years, and consists of performers from throughout the northern Maine/western New Brunswick region. Caribou, Maine Facts for Kids. Kiddle Encyclopedia.